Mad Magazine was the top humor and satire magazine of the 1950s and 1960s and one of the biggest selling magazines for young men and boys. It started to lose its influence in the mid 70s, when it lost the satire monopoly to magazines like the National Lampoon and TV's Saturday Night Live. An inexpensive way to read older issues is to get Mad Specials, which reprinted early issues. We have 324 of the 550 issues. Mickey Rodent! Presented by Walt Dizzy. Supermarkets! Puzzle Pages! The Cane Mutiny! Drawrof - (essay from a backward nation). First magazine-sized issue. Cover Writer: Harvey Kurtzman. Mad Logo: Harvey Kurtzman. Wrestling. Bofforin (Ad parody). Gluggle! Report from Russia. Is a Trip to the Moon Possible? Out of the Frying Pan and into the Soup. Newspaper Comics. Classy Crimes #138. Anyone Can Build This Coffee Table. Is This Your Life? (TV satire) Tom Swiffft and His Electric Ping Pong Ball. A Guide for Future Job Hunters. Vera's Cruz (movie satire). Pictoquiz. Pund's Cold Cream (Ad parody). Bind-Aig Plastic Strips (Ad parody). Back Cover -- Jell-y (Ad parody). Mad Magazines have been published continually since the middle of the 20th century. All our Mad Magazines for sale come with a total money-back guarantee. As a result, if you're fan of Mad Magazine, and want to buy Mad Magazines, you're at the right place. 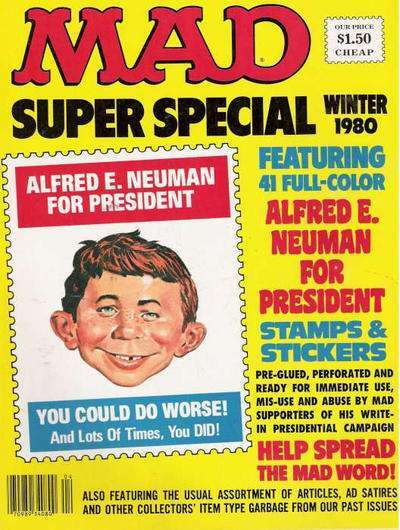 Before there was a Saturday Night Live, The Onion, or The Daily Show with Jon Stewart, there was Mad Magazine. For two generations of adolescent boys, this was the irreverent, satirical hot spot in the American cultural world. In a population of 180 million in the 1950's, Mad's circulation topped 1 million copies per month, with a readership of over 3 million. Its success was widely imitated, but never surpassed in its first 25 years. Sick magazine, Plop!, and Cracked magazine all tried, without success, to come close to the biting satirical wit of Mad. If you ever want to study American culture in the 1950's, 1960's, 1970's or 1980's, back issues of Mad is the place to go for the counter-culture's take on then current events. Founded in 1952, early issues featured the writing of top comics and comedians from all media. Ernie Kovacs, an early of star of TV, and Bob & Ray, the great radio comedy team, all wrote for Mad, as did Charles Schulz who created 'Peanuts', Jules Feiffer, Wil Eisner, Danny Kay, Stan Freberg, and Sid Caesar. For many years it was THE place to be seen by the elite comedy superstars. Mad had a near-monopoly stranglehold on political and social satire in the 50's through 70's. In fact, in 2009 The New York Times wrote, "Mad once defined American satire". If you want to understand the roots of American comedy today, Mad really is required reading. If it was a social issue in America, Mad dissected it with more depth and bite than Saturday Night Live or the Daily Show combined. For teenagers growing up from 1952 to 1975, it was clearly the most important reading in your life if you were a skeptic, politically or socially aware, or if you wanted a career in comedy. Looking at any back issue today reminds me of my rebellious teenage years, which many people will say were the best years of their lives. So, if you're looking for a gift for someone who has "everything", transport them back to their youth. I'm telling you, an old Mad Magazine from the time they were 10 to 14 years old, can't be beat. Or if you're looking for a full perspective of American society from 1952 to today, Mad Magazine is the place to start. If you're on a budget, you can read reprints of Mad in Mad Specials, Mad Follies and More Trash from Mad, which are all much less expensive than the original Mad Magazines.